I am just a little bit sensitive. Actually according to the allergist I saw, I am more than just a bit sensitive. I over-react to a lot of things. As you may be aware, I have been feeling a bit blah over the last year or so. Always feeling tired and as if I was coming down with a cold. I just thought it was perhaps a million reasons, one of which was that I was getting old. That was until I had a bizarre reaction to some trail mix. The background story is that about 3 weeks ago, I was driving to my local climbing gym and as it was around lunchtime I grabbed a couple snack bags of trail mix from the cupboard. Just enough to keep me going. I was driving along quite happily, munching through my second packet, when my lips started to itch. My tongue felt like it was swelling and my throat felt sore. I carried on driving because I wasn’t really sure what was happening to me. In a couple more minutes my eyes started to water and my asthma flared up. Things were going downhill rapidly. Luckily I spied the local food store and I knew it had a pharmacy, so I stopped off and picked up some anti-histamines. After about 15 minutes, the reaction had died down and I felt a little yucky but I was okay. I mentioned it to the Family Doctor later that week, as I have never had a food allergy before and he referred me to an allergist. The allergist did a few tests – the usual pin-prick test and a breathing test to see how my asthma was doing. My asthma has been good for years; so much so I have only been taking the reliever when it is cold or I was planning a long run. After being used as a pincushion – it’s not a nice series of tests -- and lying on a massage table, looking at the floor for 15 minutes, the doctor comes back in. I knew my back was itching, it wasn’t until he handed me the paperwork after the appointment, I realized my whole back was a mesh of welts and redness. Birch, Oak, Grasses, most household moulds, Dustmites (this was the largest and it left a welt on my back measuring 4 inches) and Cats. I had an allergic reaction to a handful of other allergens and a mild reaction to a another handful. Lots a lot of red spots on my back. It took 2 anti-histamines, a whole whack of cortisone cream and 90 minutes before I could put my bra back on! The tests for Nut allergies were all negative. So why did I react to the trail mix? It turned out the Birch allergy was the bizarre cause. I have a strange and surprisingly common reaction called ‘Oral Allergy Syndrome”. Usually it doesn’t produce the severe reaction I had, but it can in some cases cause Anaphylaxis shock. In layman’s terms – and I am layman in this --this means that the proteins in certain nuts, raw fruits and vegetables can cause an allergic reaction if eaten, but NOT on the skin prick test. Two of the nuts (Almonds and Walnuts) that are in this bizarre syndrome were in my trail mix. So problem solved… but then I look at the list of other foods in this syndrome: Apples, Celery, Peaches, Cherries, Kiwi, Pears, Tomatoes, Carrot, Pea’s, Peanuts and Sunflower seeds. Lets not forget potentially Melon, Orange, Banana, Cucumber and Cantaloupe. The strange thing is that when the items are cooked (apart from Nuts and celery), I’ll be fine. It’s something to do with the protein bonds and heat. To be fair, I only have to be extra wary if I have had a huge reaction -- so almonds and walnuts are out. The rest I just have to be very careful with. The thing is I have probably been suffering a mild reaction for years. I have long cited “citric acid” as one of my allergens; thinking it was that tart, sour, taste you get with lemons and certain fruits. Seems as if it wasn’t the acids in the fruit but the proteins. I have only really been a big nut and raw veggies eater in the last year. Who knew being healthy was bad for you? The other issue that came to light, was that I am in a permanent asthmatic state. In fact this state has been probably going on for years as well. To me I feel fine, but in reality I am only operating at about 80% of my flow rate capacity. With relievers that figure increases to about 90%, but it still way short. I never realized, I thought my asthma was under control. As the Doctor pointed out, I probably never knew a different way to be. As a kid I was so asthmatic I was excused PT at school because I couldn’t make it to the end of the court without collapsing, short of breath. So I asked the doctor what effects this would have when I was running. You guessed it, very high-heart rate. So it looks like we have an answer to my inability to do low heart rate training. My body is trying to get the oxygen it needs to make me move by letting my heart beat like crazy. I suppose in some way, this proves anecdotally, the efficiency of good form running. If I can run a 9 min mile for 13 miles on 80% lung efficiency, just think what most people could do with good running form and 100% of their lung power. The outcome? I have a new medication schedule for my asthma, we have to buy a decent vacuum and steam cleaner. We have trip to the store to buy new bedding and covers. I have to abandon all time goals on my running (which is great for me), for at least 6 months. Oh, and I have to be contentious about my housework. I knew there would have to be a serious down-side somewhere. 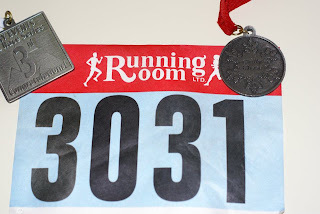 Last weekend I ran a 10K road race. 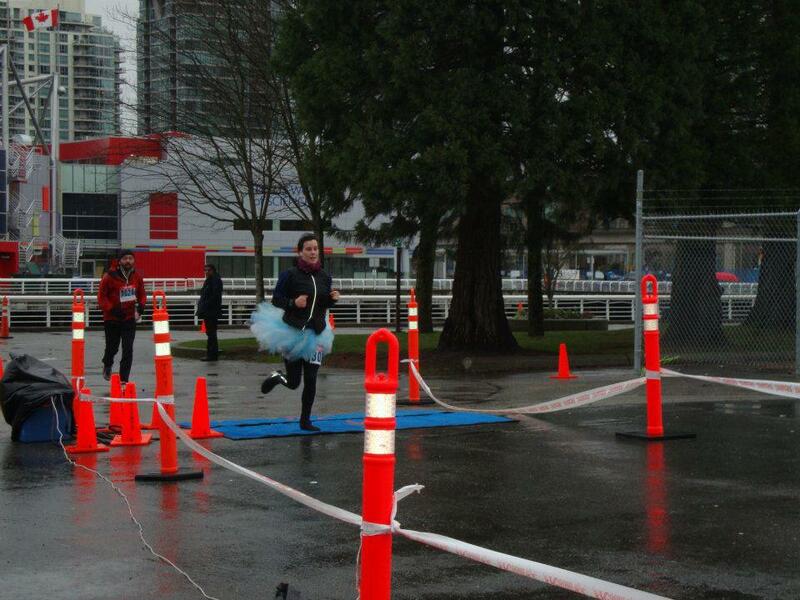 Nothing special in that really – except for the really cool TUTU I was wearing. 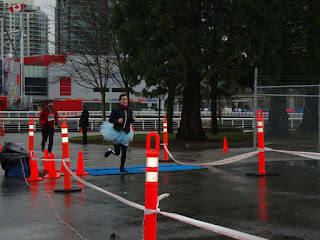 The race itself was a flat route along the Vancouver Seawall in an out and back. The weather was typically ‘Vancouver winter’ – Ice rain with gale force winds. The second stretch of the race actually wasn’t that pleasant. I didn’t go into the race with any goals or expectations. I was just going to run and see how I felt as I ran. In the end, I ended up racing it. I think it was partly due to the fact that the weather was so miserable; I really wanted to get back to somewhere warm and dry. I ended up pushing myself a little and by about 7K I was beginning to feel it. The run wasn’t un-fun. I managed to make lots of people smile. I managed to thank all of the volunteers. I wasn’t really able to talk to the other runners – the race was so small that after a few minutes we were all stretched out, so essentially I was running alone. I enjoyed the scenery for what I could see of it. It was a shame it was such rotten weather because I would have loved to take photo’s. I did a little pirouette at the turning point and I tried to make the run as fun as I could. Yes I placed, but was it worth it? The fact that I was actually running at my half marathon pace (and still dying), just goes to show how much I have lost in conditioning in the last couple of years. It hurt a little towards the end. Regardless, of all those particulars, the race ended up being an experiment. I have mentioned I have been playing around with low-heart rate training. It hasn’t been going too well. Whenever I seemed to meet my optimal zone, I was really only doing a brisk walk and I could never seem to go faster than a snail. Whenever I seemed to push myself, my heart rate would shoot up to something stupid, regardless of the fact that I seemed to be okay in myself. So during the race, I was pushing what turned out to be a 9 min mile pace (Slow I know). Looking at the stats after I got home (because I don’t check them during the run), my heart rate was really high. We are talking about – apparently – 103%/200bpm+ max in some places and I never went lower than about 175bpm/90+% for the entire race. I wasn’t overly concerned as such, just mildly curious. What was interesting was what happened afterwards. After about 4 hours after the race finished, my throat started to swell, I started to feel sick and I felt rough. I was tired and achy, but not in a good way. During that evening, I felt like I had a temperature. I was going between shivering and sweating. I went to bed early and slept for 13 hours. The next day I still felt rough. I was tired and my head throbbed. I wasn’t sure if I was coming down with a cold and my body hadn’t decided to give in. Forty-eight hours later I felt better. It has brought to my attention, that maybe a little bit of heart-rate training may be something I shouldn’t discount. Perhaps I should seriously consider giving it another go. I am not saying I should run at a pace that is so slow I am essentially walking. But taking the pace down a couple of minutes may not be a bad thing. I have 4 months training during the half-marathon clinic – another experiment. (I am pretending to be like David Attenbourgh and check out the running herd in their natural habitat). I won’t get very far if I end up being sick every week. I am not worried about injuring myself as such, but just that I will end up feeling rotten all the time. I think back to those years I was running a lot more and a lot quicker. I remember the grumpiness and the tiredness. I remember the long sleeps after a 9 mile run. That’s not how it should be. So, I have decided. I am going to hang back with the lower pace groups (they are more fun anyway). I am going to take the clinics as a social event. Okay, that was my aim anyway, but I am going to make a more of an effort to relax. I am going to slowly jog and use the extra time to talk about women in bikini’s playing soccer, or different types of beer. Yep, they are a fun group to hang with. I am going to see, how FAR I can actually run if I just slow down a little. I have realized that just because I CAN run as quick as I have been, doesn’t mean I should. I am going to learn to chill. Even though I was paying attention to my surroundings as I ran, I am going to use this as an excuse to really see where I am running. I am going to concentrate more on my form and my attitude. I may have lost that smiley spirit somewhere. I am going to really concentrate on the fun. I am going to learn to chill. of “The Run Smiley Collective” should have had under her tree I admit. I should have a TUTU or a funny hat, but not technology. Isn’t that against everything the collective is about? Have I abandoned my values?! Have I become a runner? In other news, I was talking to my good friend Jesse over Facebook a while back and aside from the usual nonsense we spout, like spy penguins taking over the world and Boobies, we talked a little bit about how, as minimalist running has become more popular, people have decided to take minimalism a little TOO far in their running. Minimalist runners are now abandoning watches, Garmin’s, iPod’s and anything else electrical as they run. I applaud this, however, my applause depends on their reasoning behind ditching the technology. When I advocate ditching the technology, the reasoning is so that people are released from pace times, distances and weekly mileages and they experience the run for what it is. A joyful way of connecting to the way you move. If you are ditching the tech for THIS reason, then I say, “welcome to our merry band of misfit’s, please enjoy your stay”. If you are ditching the technology because you feel it makes you better than everyone else –that by taking off the Garmin, you are becoming purer than your fellow minimalist runner- then please take a chill-pill and re-evaluate what’s important. This seems to be a bit of a trend. People ditching the gadgets, not so they can connect with their run, but to be “more of a minimal runner than X”. This is just as wrong as wearing the Garmin and concentrating SO much on your pace that you ignore the flowers on your trail. And do you know what? He’s right! So I am going to admit it. I like to run with an iPod. I have a play-list that I like to run with. Most of the time I only have one ear-bud in, but the music is still there. I may find a bit of fun trail and both ear-buds come out and I will have a blast, sometimes the ear-bud may be in for all of the run. Do I care? Not really. This is the reason. I run with music, not because it makes me a better, faster runner. I run with music, because the songs I pick allow me to connect with my inner fun and with my friends. I will explain. I have songs that remind me of friends, i.e. “The Cave” by Mumford and Son’s, is my connection with Angie B. “Pirates of the Caribbean” by Lonely Island (currently) reminds me of Jesse. I have songs that make me smile. The “Run Barefoot Girl” “Tick Tok” song always makes me laugh and I do a little dance in the middle. The “I am the Doctor” soundtrack makes me feel like I am being chased by aliens and I can’t help but do this without a grin on my face. So has technology meant I fail to connect to the fun on my run? Nope. In fact they add to it. My friends are there when I want them and they don’t interfere when I am enjoying where I am on my run. If I am having too much fun in my run, they step away. As for the Garmin? Am I going to use it to increase my VO2 Maxy thingie? Am I going to run harder and faster than everyone else? Am I going to brag that I run 3.2728 miles in 23 minutes and 45.3883 seconds? Nope. I am getting the Garmin as an experiment. I want to see what the fuss is about and see if it’s truly useful. I want to play with it and see if it can add something interesting to my run’s. I want to see if some training plans work and if some don’t. I am being inquisitive and trying new things. I LOVE doing that. So why is that a bad thing? The Garmin is allowing me to be an engineer on my run; allowing me to tinker and test new solutions. I am adopting the same principles when I made my hacked minimal shoes, or when I retro-tweak a pair of minimal shoes so they fit how I like. Heck, it's either a Garmin on my run or a CISCO router, and trust me a Garmin is easier to carry. So despite my “don’t let technology rule your run”, I think I agree with Jesse. If you want to wear an iPod or a Garmin, go ahead, just make sure you are doing it for the right reasons. That I am doing an on-line chat for Merrell tomorrow. So if you want to check in and throw silly comments my way, feel free. Just go to the MERRELL page on Facebook and post away. I am on-line from 1-2PM Eastern (10-11AM Pacific) on Thurs 5th Jan.